Albers Chang Architects collaborated with Hallie Henley Design on the interior renovation of a West University house, built by a developer in 1985. The newly expanded kitchen is placed on axis with both the dining room and family room, the alignment emphasized with matching cased openings. A new paneled mud room adjacent to the kitchen forms the new access to the garage, with the door concealed in the painted wood paneling. 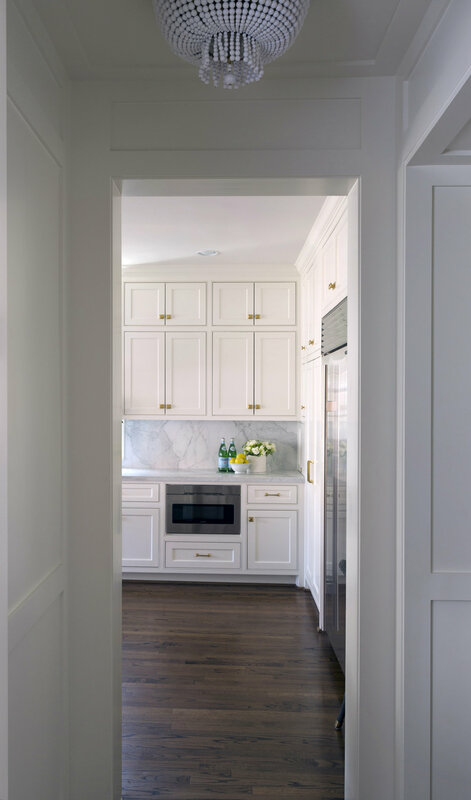 Borrowing from the 1920s, a timeless effect was achieved by complementing Art Deco inspired unlacquered brass fixtures and hardware with white painted cabinetry and a monolithic Carrara slab.